A ship burned after a fire engulfed two tankers in the Black Sea off Crimea on Monday. Fourteen people were killed and five were missing. 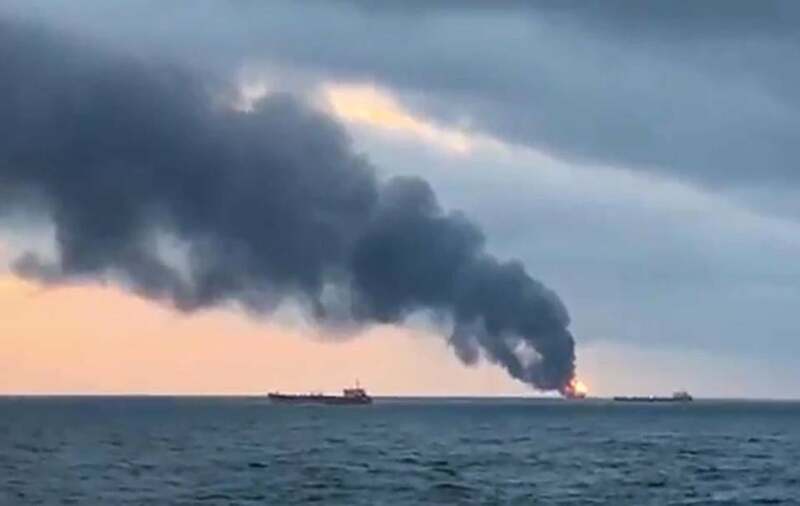 MOSCOW — An explosion and a fire involving two tanker ships near the contested Kerch Strait, the waterway separating Crimea from mainland Russia, left at least 11 sailors dead Monday and several missing, according to Russian news reports. Although the exact cause of the episode that ignited the tankers was not immediately known, fuel from one was being transferred to the other, Russian news agency RIA said. Initial reports suggested that a fire and an explosion on one ship had spread to the second. The sailors killed were from India and Turkey, the reports said, with 12 survivors jumping into the water. Some 10 ships were involved in rescue operations, according to Interfax, another Russian news agency, which said the press service of the country’s Federal Agency for Maritime and River Transport announced the toll of victims and survivors. Television footage from the shore showed flames erupting and thick, black smoke engulfing the ships. Both tankers were registered in Tanzania and were anchored just off the southern shore of the Crimean Peninsula and just outside the Kerch Strait. The strait has become another sticking point in relations between Russia and Ukraine since Russia seized the peninsula in 2014. It has invested some $7.5 billion in building a spectacular bridge and road network to connect the peninsula to the mainland. In late November, a clash between Russian and Ukraine naval forces not far from the bridge led to Russia’s seizure of three Ukrainian vessels and the arrest of 24 sailors, who remain in jail. Ukraine has accused Russia of violating a 2003 treaty under which both sides agreed to share equal access to the Sea of Azov, which is reached through the Kerch Strait.